I think that every artist is very aware of how necessary music is to his or creativity. Listening to music, classical, jazz or anything else, can help get the juices flowing, inspire and mesh with painting, drawing or any other creative activity. Most life drawing groups, for instance, that I have ever been part of have music playing in the background as a helpful adjunct to the drawing process. It was thus with no surprise but considerable fascination that I read recently in the August 14th, 2010 edition of Science News about the latest research about "A Mind for Music", an entire section devoted to music, its effects on the human brain and thus its role in societies. One of the most interesting aspects was how far back our connections with music have been tangibly shown to reach. 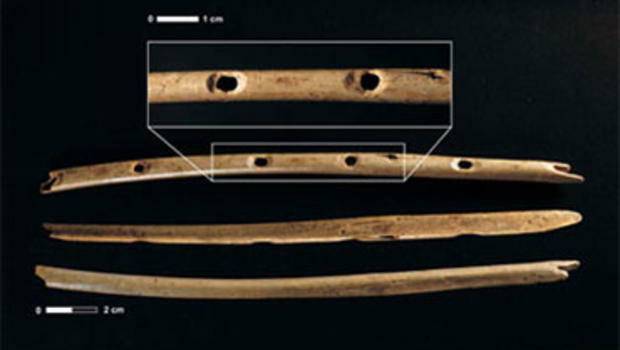 Vulture bone flutes, dating from 35,000-40,000 years ago, have been found in the famous HohleFels cave, near Ulm, Germany. Nine thousand years ago, wing bones from red-crowned cranes in Jiahu, China, were fashioned into flutes with five to eight finger holes. Five thousand years ago, harps were played in ancient Mesopotamia. Before all these instruments, there were most probably percussive stones, bones or sticks being played. How many of the early musical sounds were inspired by nature is of course open to speculation, but it puts me in mind of Lord Byron's verse: "There's music in the in the sighing of a reed;/There's music in the gushing of a rill;/ There's music in all things, if men had ears:/ Their earth is but an echo of the spheres." The noted neuroscientist, Daniel J. Levitin, who is a specialist in matters neuro-musical as well as being a consultant in the music industry, once remarked, " Music may be the activity that prepared our pre-human ancestors for speech communication and for the very cognitive representational flexibility necessary to become human." Since we now know that almost all the areas of the brain are affected in some fashion when we listen to music, his theory makes eminent sense. It is also interesting that visual art also shows up so early in the early records of human beings, as another form of communication and celebration of life. (See my earlier blog about evidence of art-making 164,000 years ago.) Vital roots that enrich us all today, so many thousands of years later. There are countless examples of artists who weave music into their creative lives - not only in paintings and drawing, but in videos, installation art, and beyond. One interesting example of the role of music in art is Edgar Degas: his paintings and drawings not only address the playing of music but the movement of dancers to music and opera scenes. He apparently was friends with many of his contemporary French composers and musicians, and had had a musical childhood with family members singing and playing the organ. The close links between his art and music were explored in an 2009 exhibition, Degas and Music, at the Hyde Collection in New York's Lake George region. A good description of the exhibition and Degas' deep love for music which ran through all his art can be gleaned from David Brickman's blog. It makes one regret not having seen the exhibition. Other artists use the music itself as inspiration for art. Paul Klee and Kandinsky come readily to mind, but many of the early 20th century artists turned to jazz and other current forms of music to act as a springboard to art creation - Gino Severini in Italy, August Mackeand fellow German Abstract Expressionist Franz Marc, and Russian KazimirMalevich. I find myself sometimes moved to create a piece inspired by music. This silverpoint, Spem in Allium, is inspired by Thomas Tallis' music of the same name. We are all heirs of those early flute and harp players who knew that "music is the poetry of the air", as Jean Paul Richter observed some two centuries ago.